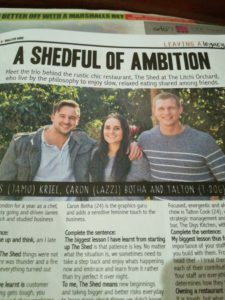 Great Q&A in this week’s Ballito Vibe about The Shed located in the Litchi Orchard. Nice to see fellow entrepreneurs keeping the grind going. Did some great events with these guys from the TDK days. Hope you guys go from strength to strength. If you ever need good quality chicken or Mayo, you know who to call.